Do you want to share Spotify songs with your friends online or promote your bands online? If so, one of the best ways is to use the Spotify play button. 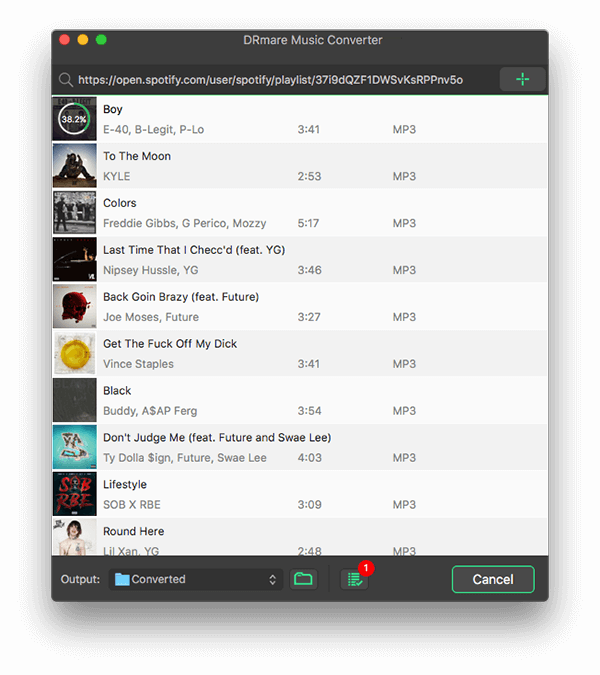 This feature offers a convenient way for users to listen to music directly without the need of using Spotify Web Player or desktop client. It works well on email, Facebook, forum, websites and blogs like Wordpress, Tumblr and so on. Here we will show you how to embed Spotify playlists to your websites in two fantastic ways. 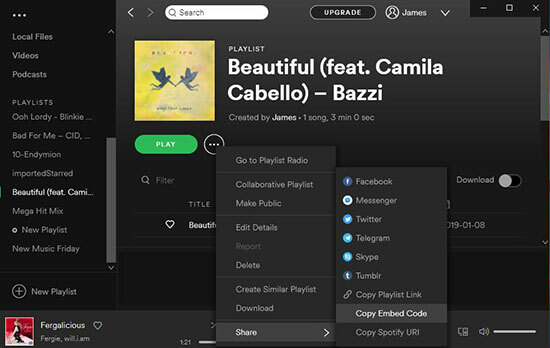 It is easy to add Spotify music to your own website or other blogs, forums of which you have access to the Html editing. Step 1. Locate the songs, playlists which you want to add to your website. Step 2. Click the "..." icon > Click "Share" > Click "Copy Embed Code" to copy the Html code to the clipboard. Step 3. Go to the page of your website where you want to add the music and open it with an Html editor such as Dreamweaver. If you are using a blog, you can add a new Widget/Html element. For forums, you can switch to the Html post editor. Step 4. Paste	the	code in where you want it and then submit the update. Step 5. You will see the Spotify play button on the page and click it play directly. To make the Spotify play button match your website, blogs better, you can also customize the parameters. 1. You can change the item size by the parameters of "width" and "height". 2. Change the theme color of the player as black by adding "&theme=black". 3. If you want to see the cover instead of the list, you can also add the option "&view=coverart". Although the process to edit the Html code is not difficult, some new users may still not be able to do that. In addition, some blogs, forum just don't provide the option to edit Html code. This means you can't embed the Spotify html code. So can we add Spotify songs without editing Html? The answer is Yes. Many blog and forum platforms also have the widgets for you to upload audio files directly. 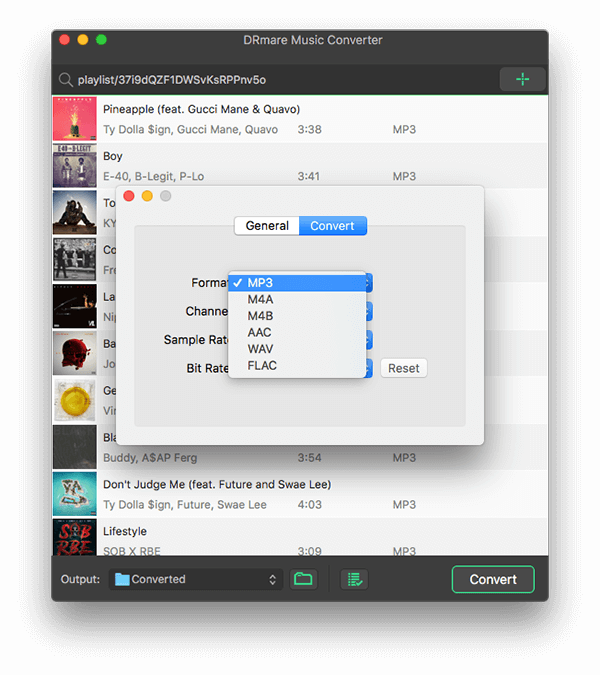 You can prepare your Spotify MP3 songs first and then you will be able to browse the files from your local computer. This method is highly recommended if you are not a tech developer. 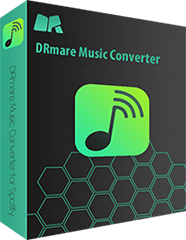 To prepare your Spotify offline MP3 songs, you can use DRmare Spotify Song Converter for Windows/Mac. It is a well-designed tool with highest performance and reliability. Yet, it provides lifetime free update so that to keep its cutting-edge all the time. 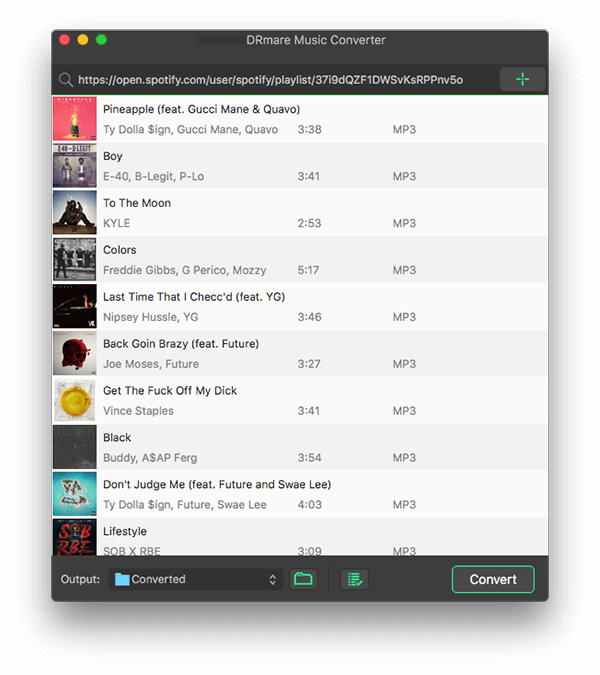 You can drag & drop the tracks, albums you want to use for your websites from Spotify app to DRmare. It supports to convert up to 100 songs at a time. Next, you can head to the top menu and choose "Preferences" to open the settings. From there, you can set the output format, channel, sample rate, bit rate as well as other parameters. Finally, please click "Convert" to apply all the settings and export the Spotify songs to your local computer. The instruction varies based on different blogs. Take Tumblr for example, you can login to your Tumblr account first. Then click the "Audio" icon from the dashboard and choose an MP3 file and click "Upload". A1: Can I set Spotify to play automatically on website after uploading? Q: Unfortunately Spotify embed code doesn't support this right now. But you can download Spotify music as MP3, then you can upload it and set it autoplay by other widgets. A2: What blogs can I upload Spotify songs? Q: Generally, it supports almost any blogs such as Blogger, Wordpress, Tumblr, Squarespace and much more. A3: Do you need to login to listen to the music with the Spotify play button? Q: You can preview 30S without logging in.